On July 26, 2006, H.R. 1704 was marked up and reported favorably by voice vote out of the House Judiciary Committee. On February 15, 2006, H.R. 1704 was marked up and reported favorably by voice vote out of the House Subcommittee on Crime, Terrorism, and Homeland Security. On February 8, 2006, a hearing was held in the House Subcommittee on Crime, Terrorism, and Homeland Security. 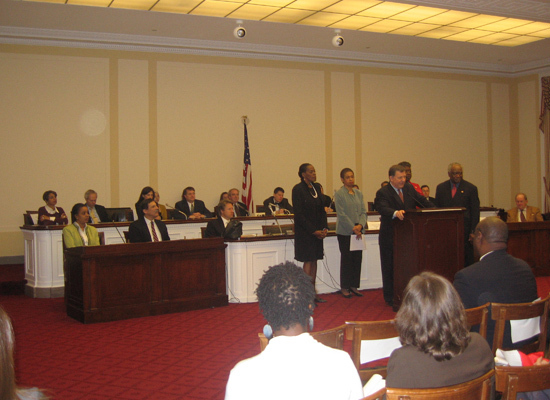 On November 3, 2005, a hearing was held in the House Subcommittee on Crime, Terrorism, and Homeland Security. On October 27, 2005, S. 1934 was introduced in the Senate by Senator Arlen Specter with 9 original cosponsors, including Senator Sam Brownback. The bill earned 37 cosponsors. Sponsor introductory remarks on measure. (CR S12014). The bill earned 114 cosponsors. On April 19, 2005, H.R. 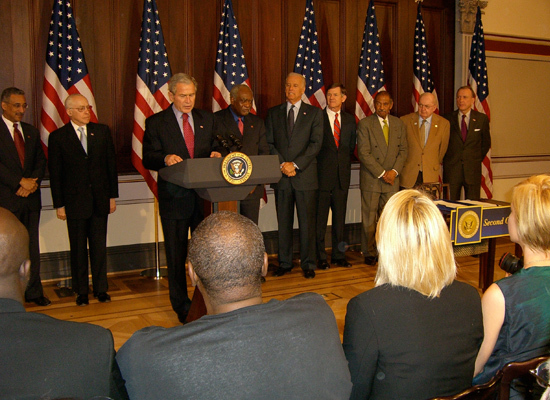 1704, a bill to reauthorize the grant program of the Department of Justice for reentry of offenders into the community, to establish a task force on Federal programs and activities relating to the reentry of offenders into the community, and for other purposes, was introduced in the House by Congressman Rob Portman with 28 original cosponsors, including Congressmen Danny Davis, Chris Cannon and Howard Coble. On September 27, 2006, the bill was signed into law by President George W. Bush and is now Public Law No. 109-287. On September 13, 2006, the House voted to suspend the rules and pass S. 2784 by voice vote. (text: CR H6505-6506). On May 25, 2006, S. 2784 passed the Senate without amendment by Unanimous Consent. (consideration: CR S5284, S5285; text as passed Senate: CR S5285). On May 18, 2006, S. 2784 was ordered by the Committee on Banking, Housing, and Urban Affairs to be reported without amendment favorably. On May 11, 2006, S. 2784 was introduced in the Senate by Senator Diane Feinstein. The bill earned 75 cosponsors. Sponsor introductory remarks on measure. (CR S4471-4472). The bill earned 313 cosponsors. On December 15, 2005, H.R. 4562, a bill to award a congressional gold medal to Tenzin Gyatso, the Fourteenth Dalai Lama, in recognition of his many enduring and outstanding contributions to peace, nonviolence, human rights and religious understanding, was introduced in the House by Congresswoman Ileana Ros-Lehtinen. The resolution earned 2 cosponsors. On May 18, 2006, House Resolution 820 was introduced in the House by Congressman Brad Sherman.